In our 5th year as a youth-led organization, we turn to the elders of San Luis and the surrounding counties to connect and generate stories and community action. Lessons will give youth skills and strategies to enable them to be impactful storytellers, ie: identifying hidden meaning, forming questions for deeper understanding, planning community events, accessing languages other than English, and combine oral storytelling with other art forms. Youth Leaders will also connect with mentors and youth from other communities to exchange skills, stories, and their histories. Youth Leaders will attend workshops ranging from wilderness survival, herbology, traditional healing, and resource preservation. Youth Leaders will facilitate community service projects that are rooted in tradition such as cleaning the communities acequias. 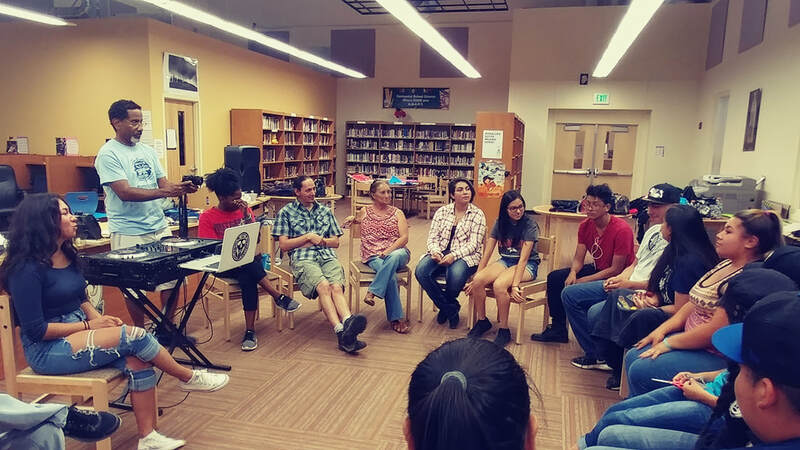 Youth engage with Grupo Sangre de Cristo, an activist group who has been focusing on preserving culture and traditions in the Sangre de Cristo area since 1981 to learn about teatro as a tool for social change. Youth engage in anti-bullying initiatives intended to give youth resources to create their own safe spaces in school​. The youth have developed a long-tern project beginning in 2014 and are working with local farmers, grazers, ranchers, in partnership with organizations such as the Costilla County Conservancy District, the Costilla County Commissioners, University of Washington, and others to outreach to their communities to discuss critical land- and water-based issues such as the health of La Vega, non-GMO farming, seed sovereignty, and other related issues and build solutions. The Youth Leaders of the Move Mountains Project are re-invigorating the rural Chicano Movement and the age-old land rights struggle between the Mexicano-Mestizo-Indohispano-Chican@ heirs to the Sangre de Cristo Land Grant and powerful outside interests seeking the resources of an ancestral mountain. Move Mountains Projects, Incorporated provides the youth with experiences that encourage them to transform their struggling community by embracing their identities as heirs to the communal land of the Sangre de Cristo Land Grant. The Move Mountains Project is an art and entrepreneurship community education program building a sustainable platform for the youth leaders of San Luis, Colorado. Our mission is to encourage youth, as heirs to the Sangre de Cristo Land Grant, to develop deeper understandings of art, resource preservation, and entrepreneurship in order to empower active community citizens through a focus on local and global social justice issues. By facilitating the Art and Science Festival for the annual Santa Ana celebration, we rally San Luis around the voices of the youth. Each year, we have expanded our programming as the Youth Leaders have guided us to find new ways to engage them and help them grow in their leadership and community action, with a special focus on summer programming. One ongoing series of projects began in 2014, in which youth developed strong relationships with organizations such as the Costilla County Senior Citizens’ Center and Alamosa University to focus on cultural preservation. They completed the oral history cultural sharing archival project entitled Voices of the Valley, focusing on loss of land and loss of language, and now plan to work with the San Luis Cultural Center to further develop cultural preservation projects. Their work with community elders also led them to build solutions to ensure long-term food security for the most vulnerable populations of their communities. Related to that, Youth Leaders have worked since 2014 to engage other youth, families, and children in their communities on a drop-in basis in their community park, encouraging holistic health and community ownership of their park, contributing to their long-term goals of building a community center there. Another long-term project the youth have developed since 2014 is working with local farmers, grazers, ranchers, in partnership with organizations such as the Costilla County Conservancy District, the Costilla County Commissioners, University of Washington, and others to outreach to their communities to discuss critical land- and water-based issues such as the health of La Vega, non-GMO farming, seed sovereignty, and other related issues and build solutions. Summer 2017 programming focused on growing these initiatives while focusing as well on recent issues that the youth brought up throughout the year. We engaged in anti-bullying initiatives intended to give youth resources to create their own safe spaces in school. Youth also engaged with Grupo Sangre de Cristo, an activist group who has been focusing on preserving culture and traditions in the Sangre de Cristo area since 1981 to learn about teatro as a tool for social change. They built their knowledge of web presence social media and vlogging, connecting with global social justice movements with other young activists and leaders, and they set up plans to keep building.